Tax group asks: Where do Hoboken candidates stand on the issues? The Hoboken Tax Reform Coalition (www.hobokenrevolt.com) has come up with a questionaire for potential mayor and council candidates for this May. 1. Objective: Drive a significant reduction in property taxes without compromising the safety and soundness of Hoboken. Question: Do you agree that the annual operating budget for Hoboken should be reduced? What do you think the appropriate budget for each of the next five years should be? Do you have a detailed plan to accomplish this? If so, what are the significant initiatives you will support to reduce the annual operating budget?What is the timeline to implement the plan? Please explain any calculations of savings that may be included in your plan. What concessions, if any, will be necessary in the upcoming Police and Fire contracts in order to achieve the target budgets you propose? What revenue-enhancement opportunities do you see? Tickets for running a stop sign or ignoring a "No U-Turn" sign soon may be less expensive for drivers in Roseville but much more profitable for the city. It's all part of Roseville's plan to encourage police to write tickets for certain types of moving violations under the city's municipal code, rather than the state vehicle code. The plan would put conservative Roseville shoulder-to-shoulder with Berkeley and a few other cities. But the plan doesn't sit well with the insurance industry. The difference for offenders? A lower fine – $100 instead of $146 for first offenses – and a driver's record without added "points" that can lead to higher insurance premiums or even a revoked license. In a move to streamline Hoboken's budget, the city announced yesterday that seven provisional municipal employees have been laid off. The layoffs mark the first stage of a workforce reduction in the city under the control of state monitor Judy Tripodi. The city is expected to reduce its workforce by 65 employees, or 10 percent of all full-time municipal workers, throughout this year. HOBOKEN - In the continuing effort to pull the city out of its financial quagmire, state monitor Judy Tripodi yesterday announced she is bringing in a new financial planner. Nicola Trasente is a former administrator and CFO of Highland Park and a municipal auditor for New Jersey's Division of Local Government Services' Distressed Cities Team. HOBOKEN - Already hard hit by the tanking economy, there's no letup in sight for taxpayers in the Mile Square City. The Hoboken City Council passed a budget this week after a rocky end to the fiscal year. The budget went from $87 million to more than $100 million during the course of the fiscal year. See timeline below. This past Monday, the city of Hoboken passed a budget for the fiscal year that actually ended on the very same day. The 2007-2008 fiscal year budget is far from perfect; it is short $3.6 million in revenue, and it excludes $8.1 million in expenses that will be paid for next year instead. That makes the total shortfall $11.7 million. It also includes more than half a million dollars in unpaid bills. But it has the state's blessing nonetheless. The approved budget is $92.6 million, but the actual total expected spending from the previous fiscal year is $100.7 million, which does not include a separate budget for the $13.4 million operations of the Parking Utility. The city's taxpayers could be hit with a 50 percent increase on their next bill, unless the city council comes up with another way to close an $11.7 million budget gap. During a heated meeting Wednesday night, council members were livid they had not been given precise budget numbers, which they requested last week and believed would be provided at the meeting. Business Administrator Richard England responded he did not realize he was supposed to bring the information but promised the administration would provide it the next morning - which it did. The administration proposed to increase a loan that would use the municipal garage as collateral from $13.9 million to up to $19 million. That loan would also need to be secured with a $3.7 million bond sale. Faced with the choice between a tax hike or de facto borrowing to bridge a several-million-dollar budget gap, the City Council Thursday night voted to do neither, opening the door for the state to take over the city's finances. Officials have described the budget gap as between $3.5 million and at least $8 million, and several council members said they couldn't vote on a fix for it until they had clearer numbers to work with. Others said they did not trust the administration's budget numbers and would welcome state intervention, accusing Mayor David Roberts of hiding overspending, a charge he denied. In an attempt to curb spending and reduce a proposed municipal tax increase, Hoboken's City Council Revenue and Finance Committee introduced a plan at Wednesday night's council meeting that if adopted, could reduce the proposed $87 million city budget by approximately $2.4 million. The budget is now six months late, as local budgets often are, as mayors grasp at revenue deals in order to hold off politically unsavory tax increases. However, this time, the council, members of the public, and the administration have suggested specific cuts. Mayor David Roberts introduced the city’s proposed 2007-2008 Fiscal Year budget of $87 million to the council this past Wednesday, the largest spending increase in many years. The city plans to hold two public meetings about the budget in the coming week. Prepare for one of the biggest city spending hikes in 14 years - with a tax increase as a result. At this past Wednesday's council meeting, Mayor David Roberts introduced the proposed city budget for July 1, 2007 through June 30, 2008. If approved at a future meeting, it will see a spending increase of $8 million from last year, to $87 million. Included in the budget is a 2.49 percent tax increase, which for the average homeowner is an increase of $221 per year for every $250,000 of assessed property, according to Roberts. HOBOKEN - The City Council voted Wednesday night to terminate all professional service contracts, ratcheting up the tension between council members and Mayor David Roberts, who called the vote a "reckless act." The council voted 7-2 to adopt sweeping resolution to immediately cancel all the contracts, citing budget concerns. Councilwoman Terri LaBruno and Councilman Michael Cricco were the two "no" votes. After questioning from Councilmen Ruben Ramos and Michael Russo, Business Administrator Richard England said spending on legal and engineering services had exceeded the budget, with two and a half months left until the new fiscal year. At the heart of the current budget debate simmering between City Hall and 3rd Ward Councilman Michael Russo is the municipal garage on Observer Highway, which the city has been using to plug budget gaps for the past two years. The anticipated revenue that the city expects to generate from the sale of the municipal garage on Observer Highway has been included as $3 million line item in the introduced SFY 2007 budget, which is approximately the same amount of money Russo claims to be able to save the city through his amendments. According to the city's Business Administrator, Richard England, the only issue currently preventing the 2007 budget from getting the state's approval, which would allow the city council to make it official, is a contract involving the sale of the garage and a developer who would be required to provide $3 million to the city on or prior to June 30 of this year, which is the last day of Hoboken's 2007 fiscal year. 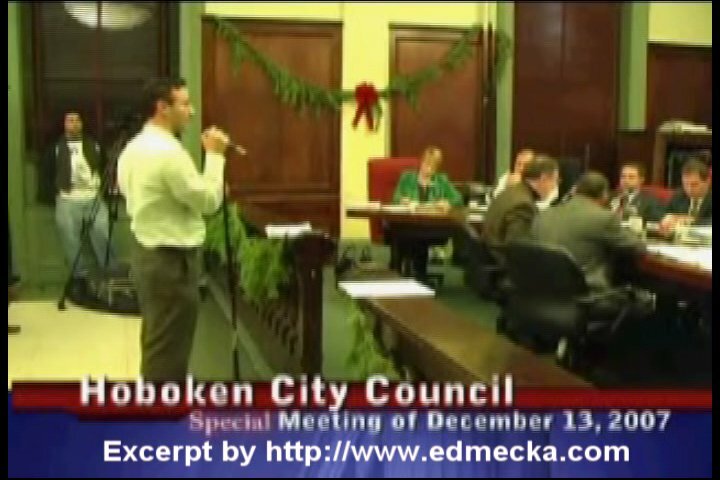 Hoboken approved their 2006 municipal budget 10 months late. Jersey City was nine months late. Bayonne was 11 months late, and Union City was also 11 months late. Since the year 2000, late budgets in these four towns have cost local politicians their jobs, forced tax hikes, and in one case, shut down city government completely. To fill the city's structural budget deficit last year, the city refinanced its debt at a higher interest rate for a longer term, which was not a particularly popular move. This year, to fill another large budget gap in its proposed $72 million spending plan, the administration of Mayor David Roberts is recommending that city sell off some of its property and front-load a number of Payments in Lieu of Taxes (PILOTs). The good news about Hoboken's proposed $72 million budget is that the tax rate is staying relatively stable. The bad news is that instead of hiking taxes, the city will again need to raise money by relying on the sales of public facilities. A sizable structural deficit, largely caused by $6.2 million in unpredicted overspending on health insurance increases and other matters, has prompted the administration to rely on several controversial one-time, non-recurring revenues. These include frontloading several PILOTs (payments in lieu of taxes from tax-abated properties) and the selling of city owned land for the purpose of short-term tax relief. This Wednesday's Hoboken City Council meeting should be one of the more interesting and contentious meetings of the year. The city's governing body is scheduled to hold a public hearing for the city's proposed $53.7 million budget for the 2003-2004 fiscal year. Also, the nine-member board will hold a public hearing and a final vote on a controversial proposal by Mayor David Roberts' administration to restructure the city's debt. At a brief meeting of the Hoboken City Council Tuesday, the city's governing body voted to introduce Mayor David Roberts' $57.3 million 2003 to 2004 municipal budget. The mayor's preliminary budget is significantly lower than the $62.8 million spending plan that was approved for the 2002-to-2003 fiscal year, which had been a big increase over the previous year. The new budget also is a couple of hundred thousand dollars less than Roberts' first budget in 2001. BUSY LOBBYING - Mayor David Roberts is preparing to present a $55 million bond resolution before the City Council. In what is shaping up to be a defining moment in Mayor David Roberts' administration, he will likely present a $55 million bond resolution to the Hoboken City Council in the near future, but passage of it hinges on one vote. Mayor David Roberts’ proposed 2003 budget hinges on $4 million more in state aid. The City Council introduced Mayor David Roberts' 2003 fiscal year budget at a special meeting of the City Council Thursday night. According to city Business Administrator Robert Drasheff, the new budget is still a work in progress and could change before it is adopted.